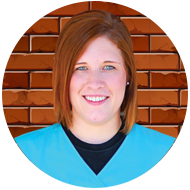 Nicole Pins is a dental assistant at Langworthy Family Dental. Nicole is a 2006 graduate of NICC’s Dental Assisting program. Shortly after graduation, Nicole joined the team at Langworthy and has been here ever since! While Nicole’s true passion is working with children, she also enjoys seeing the cosmetic improvements made for patients of all ages. When not in the office, you can find Nicole crafting, scrapbooking, and taking Harley rides during the summer. She also enjoys traveling to Arizona to see family, exploring new places, and spoiling her new-born daughter, Alexis. Nicole lives in Peosta, IA with her husband, Wes, daughter, Alexis, and dog, Britlee.